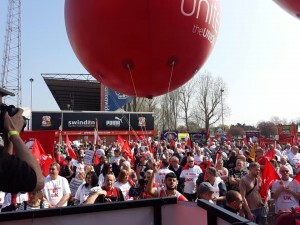 The streets of Swindon were filled last Saturday with Honda workers, their families and supporters from the trade union movement. Thousands marched against the planned closure of the car plant in 2021. 3,500 Honda workers’ jobs are on the line and up to 10,000 more affected in related industries. 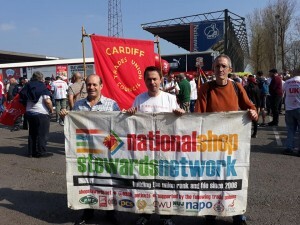 The NSSN will support any action taken by the workers to defend their jobs. We call for the plant to be nationalised, if necessary, to save jobs and communities. London Overground Vinci Cleaners to take 48 Hour strike action on 4-6 April – Rail union RMT today has announced that members working on the London Overground for Vinci as cleaners on the Arriva Rail Contract will take a further 48-hour strike action next month after voting overwhelmingly for strike action over pay and conditions. Not to sign on for any shifts commencing between 21:00 hours on Thursday 4th April 2019 and 20:59 hours on Saturday 6th April 2019. Address a funding gap caused by a situation where the school has on its roll a disproportionate number of children with an Education and Health Care Plan (EHCP). There are 4.2% of pupils with an EHCP compared to a national average of 1.8%. The situation has arisen due to the lack of alternative suitable SEN provision in the city. The school has to meet the first 20% of these additional costs. Remove the funding cap associated with the minimum funding guarantee. Restore £648,000 to the schools budget lost though this underfunding. Accept the school’s deficit reduction plan including no further cuts for three years. ← 430: Join demo to stop the Swindon Honda closure!